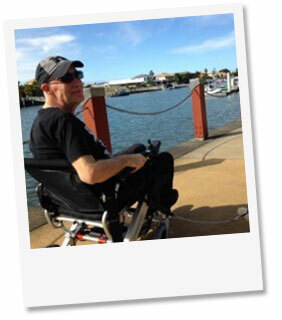 I have Motor Neuron Disease and the Smart Chair is perfect for me. It has saved my family from developing back conditions pushing me around! It’s zippy, has a great range and is very maneuverable. It’s also easy to steer and seats me well. The Smart Chair has truly changed my life for the better! I have ordered my new Smart Chair for a little over a month now and can't be any happier. This power wheelchair helps me to get around and allows me to do things again that I couldn't before. It's easy to fold and unfold and I learned how to use this chair within a few days. I love being outside when it's nice out and the Smart Chair has made that possible for me. It gives me my life back and I would recommend this chair. I wanted a personal mobility aid that is lightweight, can be folded for storage in my car trunk, and is easy to use. The Smart chair does it all. After doing my research I decided to purchase the Smart Chair instead of the scooters that do not fold. I am no longer stuck inside my home and I can do things again. This power wheelchair really has changed my life for the better. I got hurt on my job and had issues walking long distances without being in pain. Purchasing the Smart Chair has allowed me to be independent and not rely so much on my wife and family members for help. I can do things on my own! The wheelchair is sturdy and built tough. I am grateful for this wonderful product. I needed a new wheelchair that can be transported and put inside my trunk when I travel. I was lucky enough to find the Smart Chair. It's perfect for traveling and makes my life so much easier. I had those bulky scooters that are heavy and needed a lift. No more. Love this chair. I needed an electric wheelchair for my mother that is compact and easy to use with a powerful battery life. I saw positive reviews about the Smart Chair and decided to purchase it. My mom learned how to use it fairly quickly and it helped her with her walking issues since she has rheumatoid arthritis. My mom and I are satisfied with our purchase. I really needed this kind of powerchair. It has an ultralight frame and is extremely durable, sporting light weight to get around indoors or outdoor...I love this powerchair! This chair changed my life and allowed me to be more mobile. I am able to do things these days on my own, without relying on the help of others. Bought it for my very active 81 year father who has Parkinson's after he had minor knee surgery. He loves it. Easy for him to use and transport. Keeping him very active as he recovers. Highly recommend.